I have a problem. The form builder app (and some other pages too) doesn't work whatever I do. "I get HTTP Error 404.0 - Not Found error" every time. 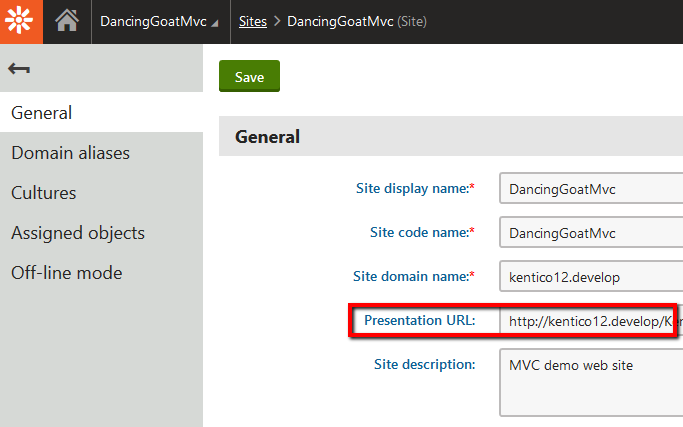 With default web site (Dancing Goat) it works fine. But with mine it doesn't. What should I do? I can't see any problem with the Presentation URL. It seems fine. I really don't know why i have this problem. I'm running into the same issue, it seems the preview URL is adding a /- to the beginning, for some strange reason. Removing it generates a 500 error instead of 404 error (even log shows the url expired, so it's valid without the /- in there, but you cant just modify it for testing). I'm seeing a similar error when trying to access the form builder. I've set the presentation URL but it seems to be not resolving correctly. It appears to be adding "/Kentico" but when I remove that and manually attempt it I get a 500 error. I have figured out my issue. You cannot name the admin portal virtual directory "Kentico" it conflicts with some of the assets. Kentico also appears to be doing some string replacement on the URL. The url looks like this .../-.FormBuilder/... but it should look like .../-/Kentico.FormBuilder/.... Maybe Kentico was getting confused? There is another possible reason for such issue. As u can see K12 admin site requests form builder view from presentation site. So in case u've upgraded from K11 -> K12 check that u have routes.Kentico().MapRoutes() line in your RouteConfig.cs of presentation site. That's simple but takes time to guess.